drivingandlife: LEXUS GS F - GRUNTY, SPORTY FUN! 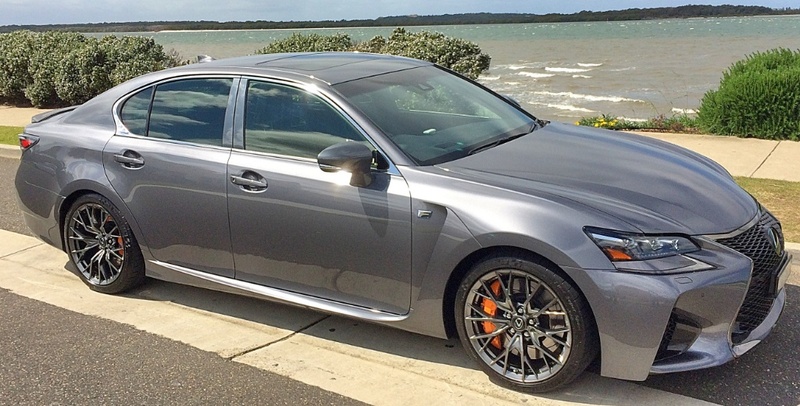 In the raceway environment, the Lexus GS F laps the snaking, ribbon-smooth track surface with speed, precision and predictability – thanks to the varied-sized front and rear Michelin Pilot Super Sport tyres, and slick torque-vectoring software. 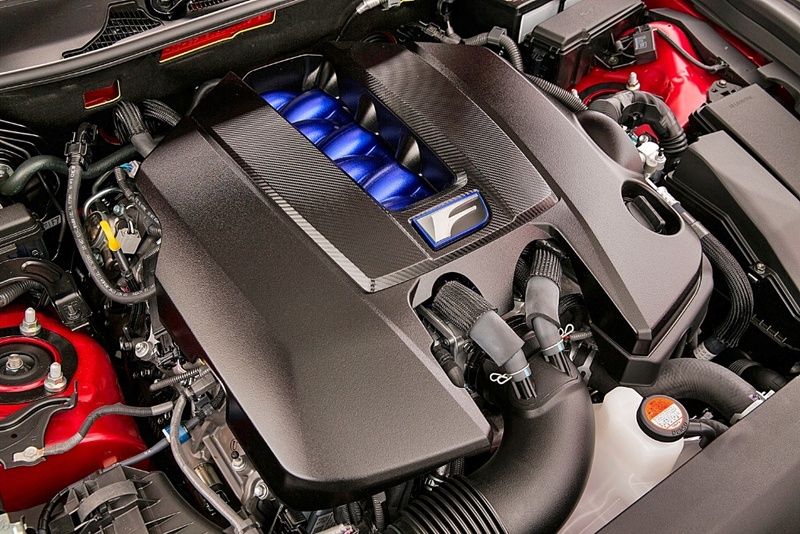 The 5.0L naturally-aspirated V8 pumps out its 375kW (470hp) with a somewhat muted roar, despite active baffles in the exhaust system aimed at giving a throaty rasp when the GS F is at full pitch. 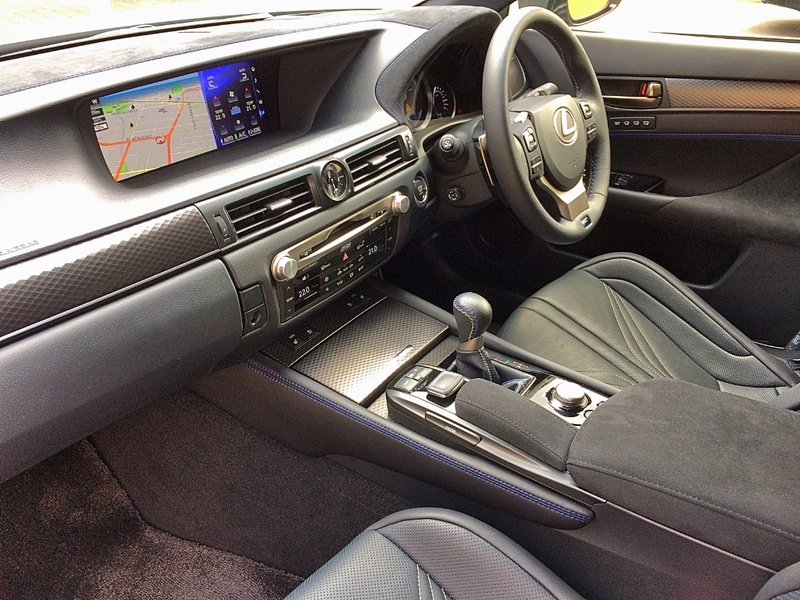 It won’t take more than a couple of laps to realise that compared with its obvious European competitors, BMW’s M5, the Mercedes-Benz C63 AMG and Audi’s S6, the Lexus has their measure, and more. Only badge snobbery could deny this car its rightful place in that high-powered selection of sports sedans. The Lexus brand doesn’t enjoy any mythical associations with iconic castles and Cotswold roads, but despite appearing on the scene only 27 years ago, the Lexus engineers have in fact perfected a car that could boast European traditions. Its Oriental heritage is evidenced in intensely-focused attention to detail. The V8 engine, which first appeared in 1989 in the LS 400, is one of the finest engines I’ve experienced – and in fact was the benchmark engine for Jaguar’s AJV8. 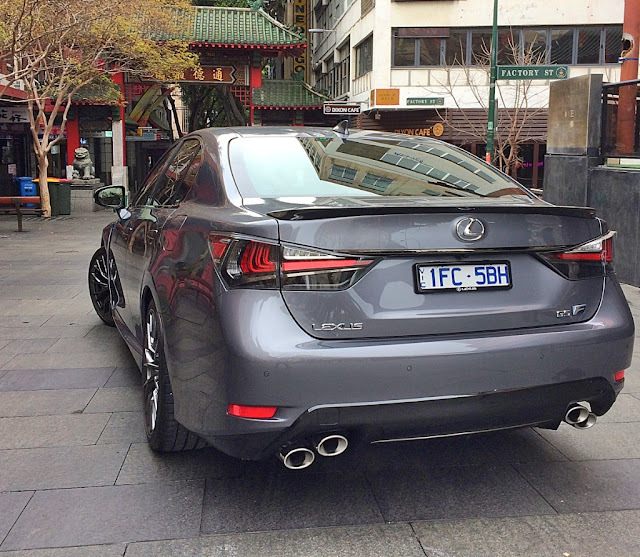 The GS F boasts all the usual sports sedan trademarks – quad exhausts, carbonfibre front and rear spoilers, and a massive side vent to exhaust heat from the front brakes, but truthfully, this car goes as well as it looks. The detail development of the engine is worth a full chapter. The 32-valve cylinder heads were designed by Yamaha, and there are lightweight, forged connecting roads, plus titanium inlet and exhaust valves. Despite its impressive performance credentials the GS F achieves 11.3 l/100km on the ADR 82/01 combined fuel economy cycle. 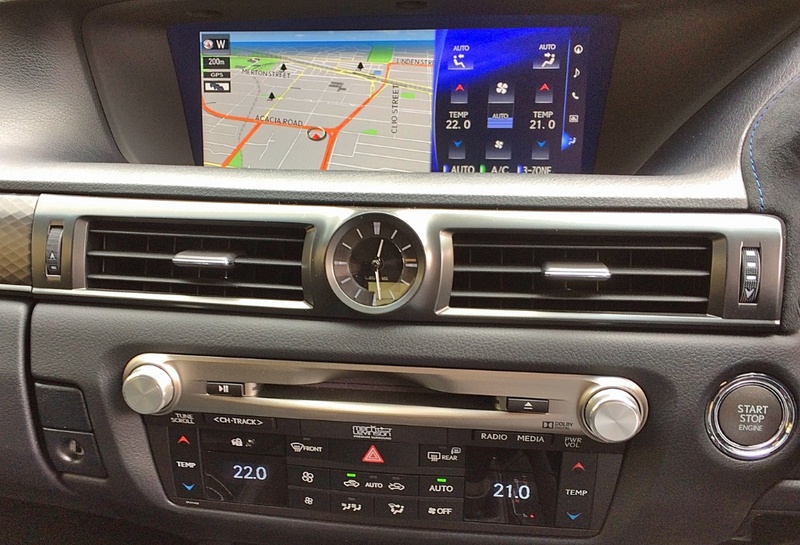 The combination of Aisin’s exemplary eight speed transmission and the programming of same by the Lexus ‘skunk works’, results in a super-smooth delivery of power. Just as well, because with maximum torque produced between 4800-5600rpm, this means both power and torque curves are steep, and it’s only the flexibility from the 8-speed ratio spread which provides mid-range grunt. However, for my money it’s not a car you could live with easily as a daily driver. The ground clearance is so ridiculously low that the dimension is not even included in the press kit! This car scrapes on a lost credit card lying on the roadway! A few bumps and scrapes later, and you'll burn through your deductible (excess). 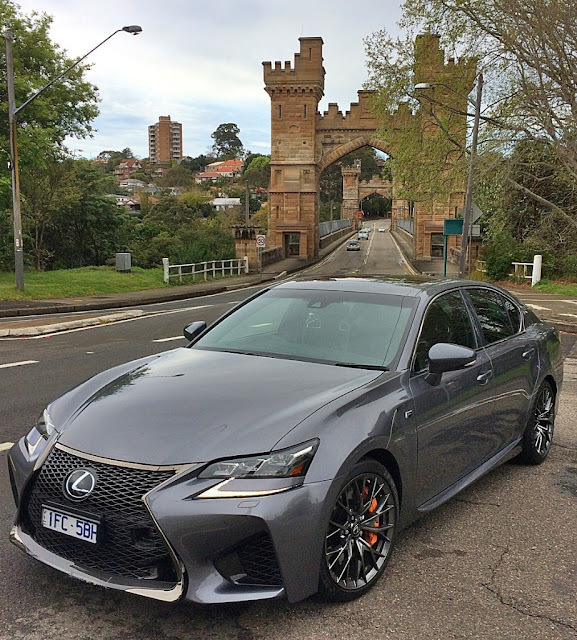 Even returning the car to Toyota’s Sydney office, the GS F scraped on every speed bump in the long driveway (8 in a row), before we even reached the reception area, despite literally crawling over them. When insuring the car you need to pay a higher premium to lower your deductible (excess). 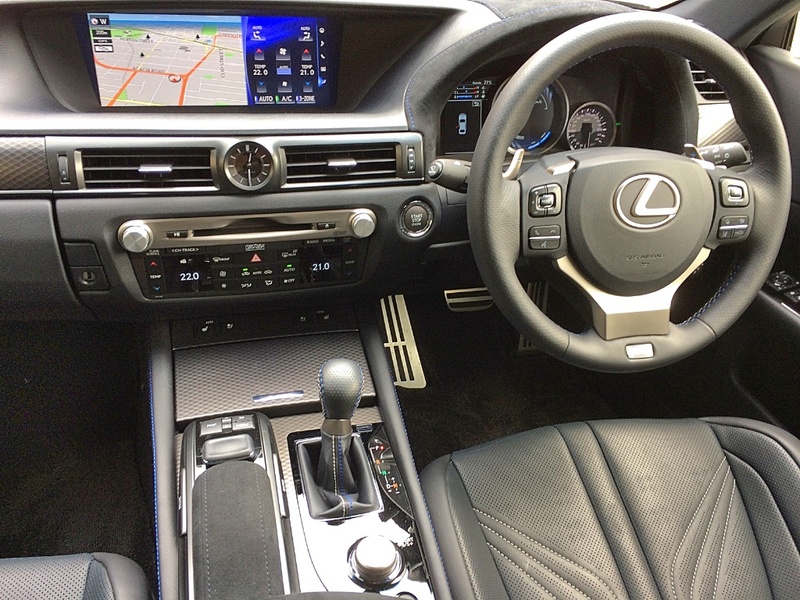 Behind the wheel however, the GS F shines in terms of its handling and steering precision, but, the ride is very lumpy, and that is one area where the Japanese failed the test – passed easily by companies like Jaguar with its F-type twins. Before even unlocking the car though, sit down and read the back story to the development of the GS F and you can’t help but be impressed – very impressed. The inspiration behind the GS F comes from Yukihiko Yaguchi, the father of F-Sport, a man who worked ‘underground’ inside the Lexus division to produce cars like the IS F, the RCF and the LFA. 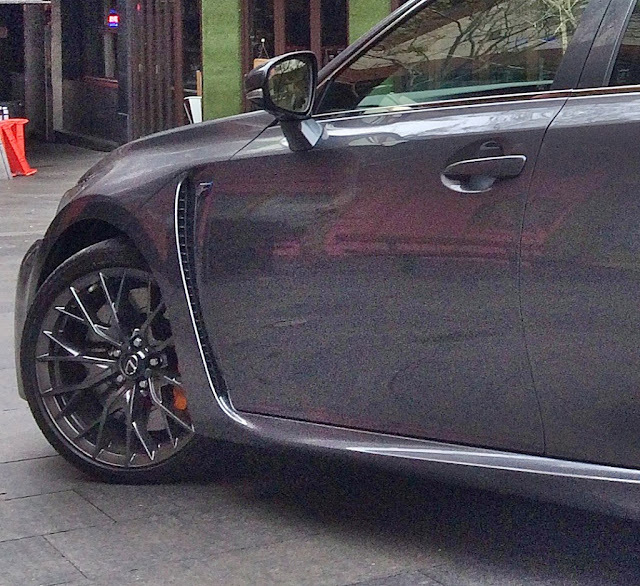 He is the emeritus engineer of this latest GS sports sedan, and the integrity of the development speaks to his relentless pursuit of perfection (to use a past Lexus advertising tagline). The GS series may have started with a very well-used rear wheel drive platform (known as the N platform), which dates back to 1991, and originally was the basis for very pedestrian, large cars, like the Crown, Cressida and Mark II. GS styling however was created in Italy, by Ital Design’s founder, Giorgetto Giugiaro. The first GS concept was badged as the Toyota Aristo, but in its later iterations, as a Lexus, has taken on a much more sophisticated personality. The L10 platform now underpins the Lexus GS F, and along with extensive use of high-strength steel, features widespread use of aluminium in both front and rear suspensions. 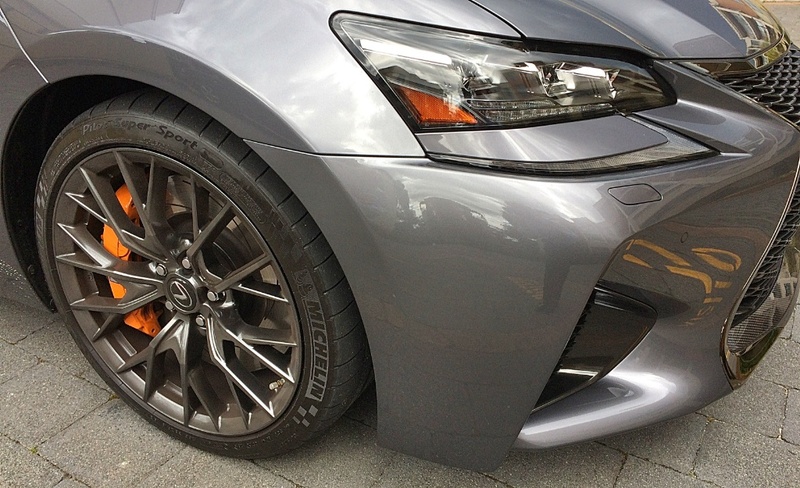 The GS F body is also larger than the standard GS range to accommodate the larger wheel/tyre combo, and increased body rigidity comes via additional bracing, high-strength adhesives and laser-guided welding. Front tyres are 255/35R 19, and the rear tyres are 275/35R 19 – fitted to quite exquisite light alloy 19 inch wheels. The grip at the limit is eye-watering, and as I said, combined with the torque-vectoring differential, you can absolutely count on the GS F responding to any steering input, instantly and confidently. Apparently the F in F-Sport is an honorable bow to the Fuji Speedway, and I can imagine Yaguchi and his acolytes putting in many hours tuning the suspension, and getting it just right! The cockpit ambience is very pleasant, and the finishes are superb, and tasteful. Touches of faux suede emphasizes refinement, and the form-hugging seats are very comfortable – for me. Big guys may have some issues. However, I do think the switchgear and feature controls are much too fussy. 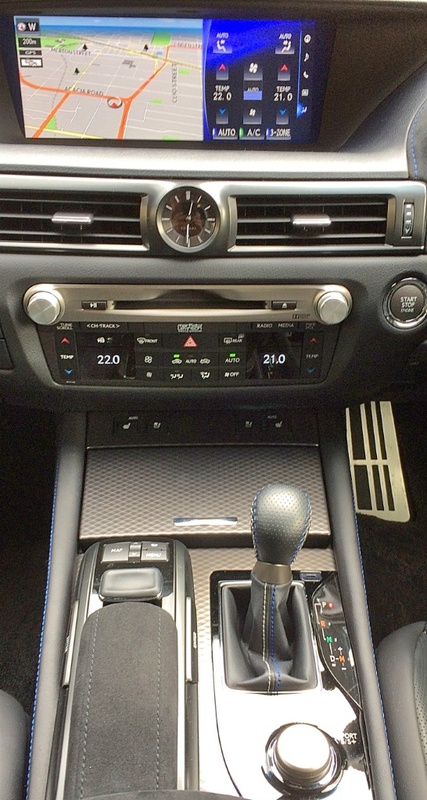 Clearly the engineers spent all their time on the performance package, leaving the interior design team little time to fine-tune the placement and intuitive action of the controls. The ultra-sensitive central control ‘mouse’ is just plain ridiculous. It’s impossible to use on the move, and even difficult when you’re stationary. Owners will spend many minutes cursing and re-selecting their choices. Let me finish by saying that the GS F has credentials the equal of any of its European-bred competition, and the performance to back them up. 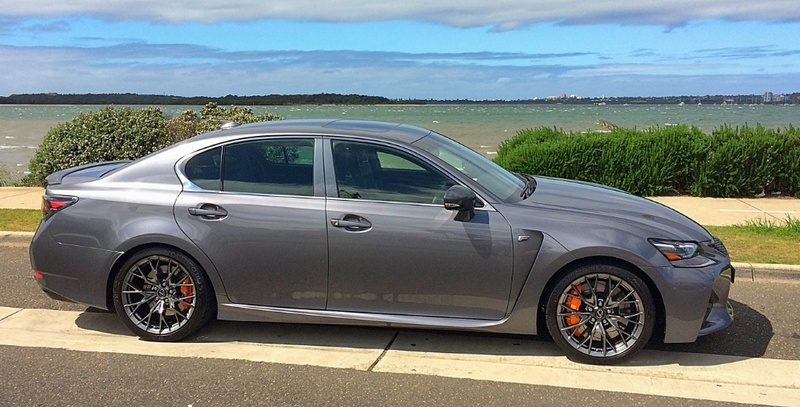 If you really must have a sports sedan, with potent performance, and very low centre of gravity – then the Lexus GS F is the car for you. Forget badge snobbery. Your peers may question your decision, but you’ll be smiling all the way to country roads or the racetrack, and the bank too. At AUD$148,800 it undercuts the Europeans by around one hundred grand! That’s right, all that, and it’s $100,000 cheaper! could you please get in touch with me.We would love to use one of your mercedes-benz images and need to figure out the usage rights.